Performers include: Karl Urban, Michael Ealy, Minka Kelly, Mackenzie Crook, Michael Irby, and Lili Taylor. This sci-fi police drama takes place 35 years into the future, in the year 2048. It’s a world in which police officers are partnered with highly evolved human-like androids. John returns to work at the encouragement of his longtime ally, Captain Sandra Maldonado (Lili Taylor). Every cop must now be paired with a robot and, despite his passionate aversion to androids, John is no exception. He’s partnered with a battle-ready MX-43 model. He abruptly terminates this pairing after the robot discovers incriminating information about him. As a result, technician Rudy Lom (Mackenzie Crook) introduces John to Dorian (Michael Ealy), a discontinued android with unexpected emotional responses. Although these responses were deemed flaws, it’s these “flaws” that John relates to Dorian most — John is part-machine and Dorian is part-human. John and Dorian’s understanding of each other not only complements them, it connects them. As he adjusts to working with his new partner, John also must learn to get along with his new colleagues, like the sharp and insightful human intelligence analyst Detective Valerie Stahl (Minka Kelly) and Detective Richard Paul (Michael Irby), a distrustful man who doesn’t welcome John back with open arms. Kennex and Dorian revisit the past when a string of murders are similar to those committed by a serial killer who was put in jail by Kennex’s father. Dorian gets his first performance review after being reactivated. First aired: March 3, 2014. What do you think? 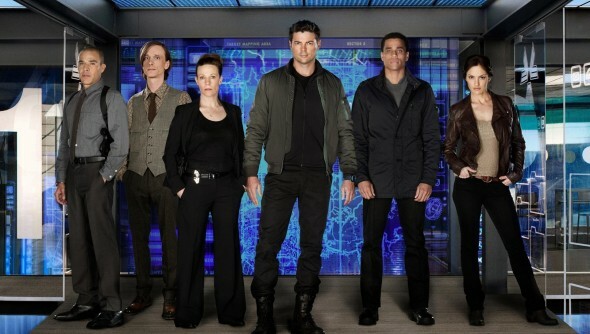 Do you like the Almost Human TV series? Do you think it should have been cancelled or renewed for another season? NETFLIX SHOULD HAVE PICKED THIS UP! THEY PICK UP ALL THE GOOD ONES THAT AMERICAN BROADCAST CHANNELS DROP!! Loved it, such a pity it was cancelled. Miss this show – want another Season! This was a great show indeed I really liked the android character and was shocked when it was cancelled. I think the time slot probably wasn’t good, but that shouldn’t ruin a plausible and entertaining show! Whoever cancelled this show should be fired he or she is a complete moron. this was a great show but once again fox cancels great shows and keeps stupid shows like family guy and other stupid shows. You need to keep the good action ones not these stupid 30 min sitcoms! So tell the moron that cancelled it that he or she is an idiot! Almost Human should have been renewed due to exceptional script writing and a new fresh cast of actors with great chemistry starting with the very first episode. I don’t understand why such an innovative series gets cancelled while Marvel’s: The Flash can monotinously stay on the air. That was such a great show. I’m so sorry that Fox decided to cancel it and really wish they would pick it back up. A great, quality show. WTF these stupids to stop a great tv show. If this continued it could be in 7.5< in ranking. hate these cancellations. The show was cancelled so they could do Gotham. Bring almost human back. Great show and great actors.